Betty Joel was born Mary Stewart Lockhart in Hong Kong in 1896. In 1918 she married Lieutenant David Joel, and the couple moved to England where they set up a furniture-making business. The venture began with Betty designing pieces for her own house. This led to commissions for friends and setting up a small factory at Hayling Island, with a rented showroom on Sloane Street, London. Initially much of the furniture was made in teak or oak. This was known as ‘Token’ furniture, and the factory at Hayling Island was given the same name. 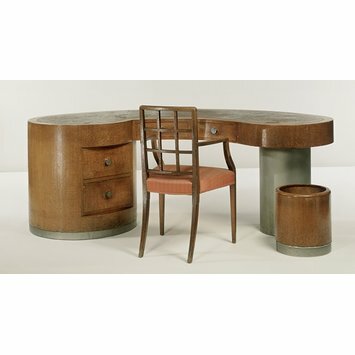 Such was the popularity of Joel’s designs that by 1929 the factory moved to bigger premises at Portsmouth, while she (with her husband) bought a large terraced house at 25 Knightsbridge to live and work in. Many of England’s social and corporate elite commissioned Betty Joel to design interiors and furniture for their homes and offices. 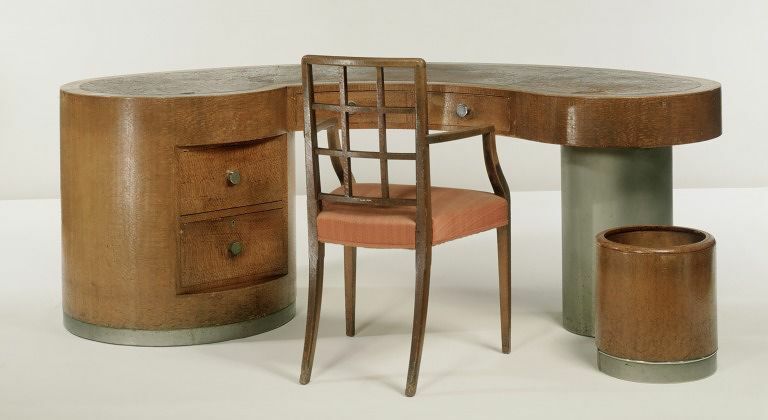 This desk was once part of a suite of furniture designed for the office of a Harley Street eye surgeon, F. A. Williamson-Noble. The curvilinear form and use of exotic wood veneers, with contrasting Monel Metal (copper-nickel alloy) base and handles, was typical of Joel’s style at this time. Influenced by the rich materials and clean lines of French Art Deco furniture, as well as the functionalism and craftsmanship of the Arts and Crafts movement, Joel sought to create pieces that were beautiful, practical and finely crafted. Who was Betty Joel? British Furniture design between the wars, Apollo, No. 401, Vol CXLII, July 1995, pp7-11; p.8. Designed for the consulting rooms of the eye specialist F.A. Williamson-Noble.